Spring is generally the most popular time of year to sell a house, with hordes of buyers looking to move into a new place before the school year begins. But if you decide to sell your home during the winter you could beat the spring rush and reap the rewards. 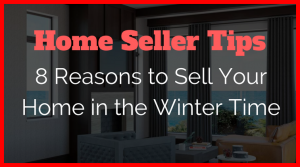 It’s true that fewer people tend to list their homes during the winter months, but this means that your home has a better chance of standing out, as there will be fewer competing listings. Since spring is the most popular home-selling season, the housing market is ultra-crowded with options at that time of year. Wouldn’t you rather be the only home for sale in your neighborhood, than have three of your neighbors also selling at the same time? The baby boom in September may lead to more buyers later in the year. According to data from the Center for Health Statistics and the Social Security Administration, there are more birthdays in the month of September than any other time of the year. Therefore, there’s likely to be a crop of growing families looking to buy a larger house. “Once baby is home and settled, these parents may want to start the year in a new, and more spacious, family home”. However, these looky-loos tend to be scarce during winter months. When I have buyers looking for homes in January and February, they’re real buyers looking to make a purchase—especially if it’s a great house. They don’t want to take the chance of waiting until spring and losing out on the home. Redfin looked at home sale data found some surprising things. Contrary to popular belief, homes listed for sale in the winter sold faster (by an average of one week), and sold for 1.1% more money relative to list price. The benefits of selling in the winter were true both for markets with very cold climates as well as markets with warmer climates. One of the biggest months for corporate relocation is January/February, so those buyers, who need to move quickly, are out in full force looking for new homes. Re-locators typically have a limited amount of time to uproot their families and, as a result, don’t have the luxury of spending a lot of time looking at properties. The kids need to get settled into school, and dealing with selling their old home can add another level of urgency and stress. So it’s likely that once they find a home that meets their requirements, these buyers will be ready to sign on the dotted line. Many people that have been savings for home get their Income Tax returns early in the year and are ready to step up and buy a house. In most cases, you’re selling your house because you’re looking to buy another. You have the benefit of less competition for your ideal next house when you’re not shopping during the hotter spring sales months like April and May. Negotiating with contingencies that your house sells as well could be more acceptable with fewer buyers to compete with.